Look ahead and look behind can be very useful to match a pattern which is followed, not followed, preceded or preceded by a certain pattern. e.g. We can match a String which is not followed by another specific string. Look for hello which is not followed by world. We’ll use the pattern (?! world) for negative lookahead. hello is followed by world. So negative look ahead should fail. hello is not followed by world. So negative look ahead should succeed. Replace hello (with NEWVAL) which is followed by world. We’ll use the pattern (?= world) for positive lookahead. Look for hello which is not preceded by any non alpha numeric character. We’ll use the pattern (?<! [a-z0-9]) for negative lookbehind. Replace world (with NEWVAL) when it is preceded by hello. We’ll use the pattern (?<=hello ) for positive lookbehind. The flag i after / is used for ignoring case. 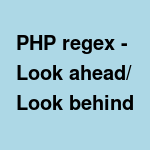 The lookahead or lookbehind does not become part of pattern match ($matches in preg_match) or replaced content (in preg_replace).